There is nothing quite like finding a new author whose book you fall in love with instantly. When the book you read is that author’s debut novel you are both disappointed and excited. Disappointed because you can’t gobble up everything else the author has written (because this is their first novel) and excited because you’ll (hopefully) have more of their stories to look forward to. I was overcome with these emotions when I finished Leah Thomas’ debut YA novel, Because You’ll Never Meet Me. Ollie and Moritz are two teenagers who will never meet. Each of them lives with a life-affecting illness. Contact with electricity sends Ollie into debilitating seizures. Moritz has a heart defect and is kept alive by an electronic pacemaker. If they did meet, Ollie would seize. But turning off the pacemaker would kill Moritz. 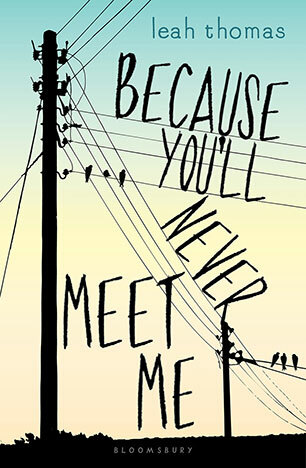 Because You’ll Never Meet Me is one of the most extraordinary books I’ve read in a long time! This book is unlike any book I’ve read and I struggle to express how truly wonderful it is. The story is original and intriguing and the characters are two of the most interesting teenage guys you’ll ever meet. The story is told in alternating chapters, by Ollie and Moritz, two very different guys who could never meet but find solace in the letters that they write to each other. Ollie lives in America, in a cabin in the woods with his mother, far away from civilization and everyone else his age. Ollie has know nothing but this isolation for as long as he can remember. Ollie must live this life because he is allergic to electricity. Whenever he gets close to anything electrical he starts to see loops, swirls and plumes of colour, which triggers crippling seizures. Moritz lives in Germany, was born without eyes and sees using a form or echolocation, like a bat. He also has a heart condition and is kept alive by a pacemaker. He is ignored by his peers and tormented by the school bully. Ollie and Moritz can never meet, because if they did Moritz’ pacemaker would make Ollie seize. Through their letters to each other they share their experiences and their unique lives, giving each other strength when they need it the most. Leah Thomas hints that there is some connection, other than through their letters, between the two boys, and when this is revealed the story goes in a different direction. I won’t talk about this as it is a great twist in the story. I got completely caught up in Ollie and Moritz’ stories and put myself in their shoes. You know it’s a great book when you want to know what’s happening with the characters when you’re not reading their story. My heart was in my throat so many times while I was reading and I just kept on hoping that Ollie and Moritz would make it through their tough times. One of the things I love the most about Leah Thomas’ book is that she tells this incredible story in just one book. Everything comes together perfectly at the end and there is a real sense of hope. You don’t need any more books to carry on the story of these two characters. They stay with you and you can imagine where their story might go next. Because You’ll Never Meet Me is a truly memorable story that will stay with me for a very long time. I highly recommend it, especially if you love Annabel Pitcher or R.J. Palacio’s book, Wonder. Hi Leanne. It’s definitely YA. It deals with a few issues so probably not suitable as a read aloud. Would be fine for a good Year 7/8 reader though.